Today is another segment of the *Home Depot Gift Challenge. Our material this month is concrete and the gift recipient is “good old Dad”. I have done a little bit of experimenting with concrete in the past with my geometric earrings and love the versatility of concrete. I knew that I wanted to create some sort of sculpture. My husband loves art and especially simple design. I was inspired by a bag of goose feathers that my boys collected after an epic bird fight outside our home. They wanted to make something with the feathers for Dad. So….that is what we did. My first step was to pick up a bag of concrete mix from Home Depot. I also picked up some concrete acrylic fortifier. The concrete fortifier should increase the strength of my concrete. Here are the feathers that my boys collected…. I told you it was an epic bird fight. To kill any mites that might be lingering on the feathers I bagged them and stuck them in the freezer for 72 hours. Then, I washed the feathers in bleach and water and laid them out to dry . It might be overkill, but it made me feel better. I coated the inside of a plastic cup with thin layer Vaseline. In another cup, I mixed the cement mixture and acrylic fortifier. I used a 50/50 ratio. I poured the mixture into the bottom of the Vaseline lined cup. I stuck a feather in the center of the concrete mixture and allowed it to dry for 48 hours. I applied a few coats of heirloom white spray paint to my little sculptures to get a sleek and simple look. 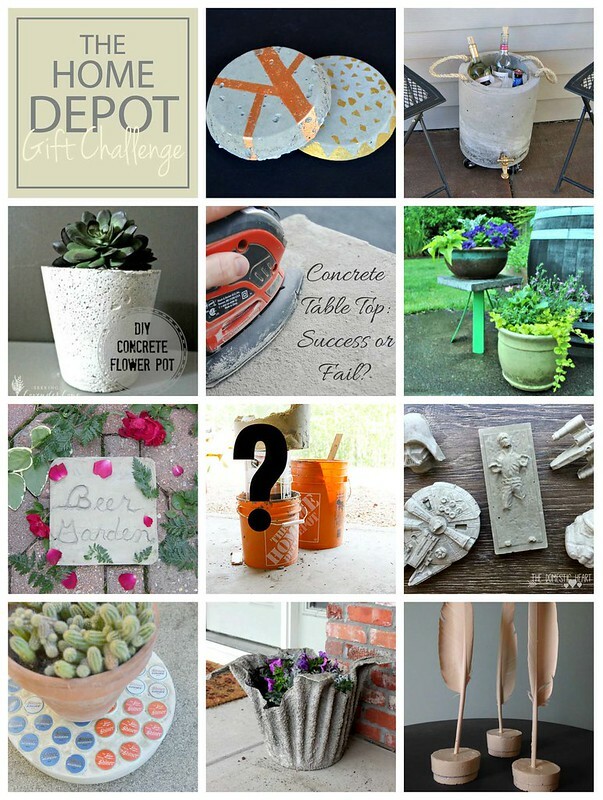 Before you go check out what the talented bloggers created with concrete in the Home Depot Gift Challenge. *Home Depot is in no way connected to this challenge or the amazing projects associated with the challenge. We just like to shop there. This makes a great little vignette, cute idea! Thank you so much Roxanne! These are adorable! Such a clever way to display the little feathers. I bet your boys just loved seeing the feathers they found used in such a cool way! Amanda thank you so much. My oldest was super proud of his feathers on display. So cool! I love the idea of using concrete to create a base for displaying things. Love the way this turned out! very cool! I thought you had put concrete on the feathers too…I was wondering how you pulled that off. Love it..really unique! These are beautiful, Carmody!! So unique and so clever. :) Great job!! Wow Carmody! That color is beautiful on them, like they’re all concrete (I totally thought they were at first too). Thank you Lynn! It is much easier than creating the feathers out of cement.